As Tuesday, 11 December, 1990/26oC dawned, Britain was in the grip of some of the worst weather ever recorded. Much of the country was battling against heavy snowfalls, gales and blizzards - and life off the Kent coast was no better. As a mark of solidarity with the thousands of people inland who were without power, Caroline's generator was silent and cold - and the Ross Revenge was deserted. With the transmitter silent for over a month, with a technical problem beyond the scope of the crew currently on board, the said crew were already dispirited. The main generator had failed as well, leaving them in freezing cold and in danger as the ship not sufficiently lit. When the gales that then hit them resulted in the supplies of petrol for their only working generator being swept overboard, that was the last straw for them, and they requested a lifeboat to take them home. But as the seas were far too rough for a boat to reach them, or indeed safely transfer them from ship to ship once it was alongside, the Coastguards had contacted the Air-Sea Rescue service based at RAF Manston in Kent. A helicopter was despatched to the South Falls Head and three persons were airlifted back to the mainland. A photo was shown of the rescued three on the Television South news at 11.55 GMT. They were named in the report as Rico Marks, Chris Massey and Caroline Cooke. Later in the day TVS news showed a fragment of an RAF video of the Ross Revenge from which it could be seen that the deck has been repainted red but still displays the fregency "558", and that the two masts are still intact. By then the ship was no longer reported as being deserted, but "A salvage crew has spent the day preventing the pirate radio station Radio Caroline becoming a danger to shipping. The generator aboard the Ross Revenge failed in high seas, leaving the ship unlit in the water off North Foreland." It was most essential that the ship was lit according to the regulations that pertain to ships at anchor, as without the correct lighting she would be a serious hazard to navigation - the last thing anyone wants is for the Ross Revenge to make the national headlines because she and an Olau ferry are a tangled heap at the bottom of the North Sea! evening. Althought the weather conditions made it extremely unlikely that boarding would be possible it was thought that an attempt might succeed. In the event, however, although the tender reached the ship, and spent two hours trying to come alongside, it proved impossible to transfer any crew across. At about eleven pm last night, with the crew of the tender not only injured but suffering from exposure and exhaustion, the attempt was abandoned for safety reasons. During the course of today the Authorities will be informed of the outcome of the trip' and assured that another attempt will be made to board as soon as weather conditions improve. Suggestions that a salvage team have left from a Continental location are not thought to be true. The Coastguard don't seem unduly concerned about the situation of the ship so long as is doesn't drag its anchor... 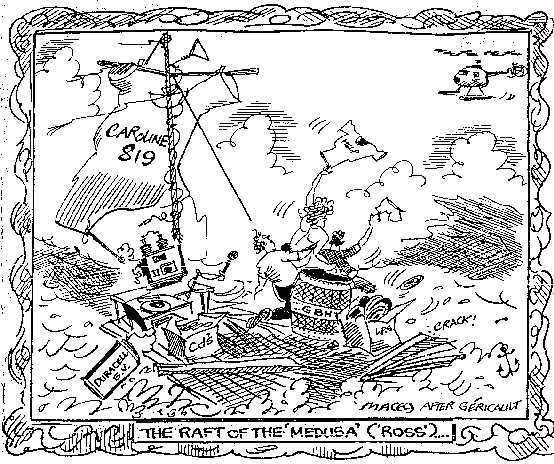 There is no suggestion that anyone other than the crew of the Ross Revenge are intending to board the ship, but they are prepared to give an undertaking that no attempts will be made to broadcast if they are allowed to reclaim the ship." Christopher England, a member of the campaign to bring Caroline on land, talked to Caroline Martin and reported more of the background from a different point of view on his own info-line: "For the past few weeks life on board the Ross Revenge had become increasingly more and more difficult... Rico, who had been on the ship for nearly six continuous months, was in charge... the broadcasting crew slowly evolved into a caretaker crew, struggling to keep the ship just functioning and existing... two weeks ago, Neil and Alex left the ship, to be replaced by Chris Adams... the main diesel generators had failed a lone; while ago, with the huge lorry-type batteries unable to take any charge. With no battery power, they were unable to run the starter motor to get the generator turning again... without the main generator there was no heat, and no standard lighting... for some time the crew had been confining themselves to the bridge, running a small, Honda petrol generator on deck, which produced just enough power to run a single-bar fire and a string of lightbulbs, some of which were outside to light the ship at night for navigation purposes... with the weekend of snow blizzards in Britain came force nine gusting gales and north-eastery winds. waves were constantly breaking over the ship and the wind blew out some of the panes of glass. The little Honda generator on the deck started smashing itself from one side to the other. Bravely, Chris Adams and Rico managed to battle against the water that was rushing all over the deck to haul the generator inside. At one stage the movement of the ship caused Rico to slip and knock himself unconscious as his head banged against the generator Eventually they managed to resite the generator inside the bridge with them. Rico had to use a hammer to unbuckle the flywheel before it would work again. The exhaust fumes were intolerable, yet without it there would be no lights, no heat and no communications with the outside world... their clothes were permanently wet, and, soon, their bedding... they all felt continuously nauseous, and unable to get warm. They started regular contacts with the Dover Coastguard, and appraised them of the situation using the marine radio, but saying that they were OK. The Coastguard reassured them that they would be listening, and they would stay on hand if they were neeed. They also commented that they thought they were crazy to try to stick it out, but they wished them luck. Finally, they lost their remaining stocks of petrol and at six am on Monday the tenth they made an emergency call to Christopher England for help, with only a few hours of petrol left. It was far too rough for anything to be launched to take supplies or replacements so they were advised to hold on for as long as possible... suddenly, at just before nine pm on Monday, the power failed for the last time. The batteries would not support the use of the marine radio to tell the Coastguard that they were once again unlit; but one final call was able to reach their contact on land, who telephoned the Coastguard to inform them of the situation. The information he provided was later backed up by 'Dave the Fish'. He contacted the Coastguard and added that he had now believed, from communications he had received, that the crew of the Ross Revenge were in a dangerous situation where they needed outside help. At just before eleven pm a Sea-King helicopter reached the Ross Revenge and some how managed to airlift the three to safety. They stayed with Kent Police for some time, answering questions, before finally being released. They were full of praise for the bravery of those at RAF Manston." Christopher concluded his report with the remarks "It's Christmas. Rico, Chris Adams and Caroline Martin... have no money to buy Chrismas presents for their families, their friends, their loved ones. Your call to this newsline has cost you a fortune! The part we get is going directly to them. Thank you for calling." We can confirm that it costs 'a fortune' to dial the type of service which British Telecom provide for Christopher; unlike the CM line, there is no limit to the length of message which he can record, and the caller pays up to 48p per minute listen to it. But if you do have a fortune to spend (or access to a free 'phone!) you can hear Chris with Ross Revenge Reports on 0836 404505. The Isle of Thanet Gazette on Friday added some more details of Monday night's rescue, under the headline "Saved at midnight - dramatic airlift from ship in force ten gale": "The dramatic rescue by helicopter crew from RAF Manston took place amid twenty-five foot waves and winds gusting up to fifty miles an hour with freezing rain on Monday. The radioship's two huge aerials, a hundred and fifty foot high, made hovering overhead a 'hazardous operation. The three were winched up and flown to safety badly shaken but unhurt... The helicopter was called at ten thirty pm. It picked up the three people and brought them back to Manston at midnight." After two very anxious days, the CM Newsline was updated at 12.25 GMT on Friday, when we were all very relieved to discover: "At eleven am this morning - Friday the fourteenth of December - a friendly boarding party reclaimed the Ross Revenge on behalf of the owners of the vessel. The boarding attempt was brought forward by twenty-four hours in view of rumours circulated elsewhere that two salvage vessels were at sea heading for the ship. While these rumours were not confirmed, the owners did not feel that they could take the chance that they were true. As I speak, the boarders are attempting to fire up the main generators on board the Ross Revenge, but in case this can't be done before nightfall they have taken additional generator and fuel to run temporary lighting. When power is restored, the first tasks will be an inventory of the ship's stores and what the management have described as 'a good spring clean' ... The Ross is again manned by a friendly crew and all is well." Christopher England's line added: "The ship, thank God, is now back in the hands of the Caroline organisation, there's a skeleton crew on board; they have made a promise to the Department of Trade and Industry that absolutely no work will be carried out to make the ship ready for broadcasting again, but they are involved working at the mqment to restore main power and services." We are given to understand that one member of the 'skeleton crew' is none other than Peter Chicago, who took some huge lorry batteries out with him to start the main generators, and by Friday evening had restored full' power, lighting and heating to the ship - once again, Mr Magic Fingers comes to the rescue! Of course we have no idea for how long the voluntary moratorium on repairing the transmitting installation is to be in force; so we'll just have to keep turning on and tuning around and keep hoping to hear something sooner or later - the Caroline Spirit is never down for very long! The Broadcasting Bill passed through Parliament and received its Royal Assent with some very dubious amendments to the Marine, etc., Broadcasting (Offences) Act 1967 intact. These included granting the right to any person acting under the authority of the Secretary of State to board any vessel in International Waters without the permission of the ship's master if it was suspected that the vessel could broadcast to the United Kingdom. However a further amendment was added, which provided that if she ship was registered then the permission of the country of registration must be obtained before any boarding could take place. The Act becomes law on 1 January 1991. By finding it necessary to make these amendments to the 1967 Act, the government is tacitly acknowledging that the raiding of the Ross Revenge in August 1989 was not legal. "The government who at all times insisted that Radio Caroline was on a stateless ship which had no protection at all have shown themselves to be liars by now contacting the flag state, for permission to close Caroline by force and seize the ship" is the no-nonsense way this is expressed in the information booklet pul)lished by the Caroline Legal Fund on 17 November 1990. They predict "The next planned raid will be just as illegal as the last, but still it will happen." 25 The Meadow, Chislehurst, Kent BR9 6AA. This address is for postal communication only. Any donations that you have sent recently to the old address have now been passed on and have already been put to work. The lawyers that have been employed to prosecute the Dutch Authorities and the British Department of Trade and Industry for boarding the Ross Revenge in August 1989, threatening and manhandling the crew, taking away broadcasting accoutrements and causing considerable damage to eqipment on board the ship, believe that the injured parties have a very good case. But conducting an international court case involves phenominal costs, which are quite out of reach of the victims of the raid, which is why the CLF has been formed. "Our costs are running at £200 per hour and if we run out of cash, our case will fail" claims the CLF, while "The government as you will realise have unlimited funds to try to defeat our action." So, much more cash is going to be needed to seethe court action through - please do send as much as you can afford, as often as you can afford it! available, for which a further donation of £2 would be appreciated to cover the printing costs. The advent of Spectrum Radio on 558kHz made Caroline's signal virtually unusable in much of the London area and with only one transmitter onboard, the offshore station was forced to abandon the frequency that was still the best available for most of Britain and the Benelux. So on Thursday, 4 October, 1990/26oC the transmitter on board the Ross Revenge struggled into life on the frequency forcably abandoned after the Raid fourteen months earlier - 819kHz. Radio Caroline was then to be heard on this channel most days (full details will be published in "Monitor" number 39, sometime next year) until Monday, 5 November. Unfortunately during the last week on the air the rebuilt and much-modified old short-wave transmitter that was still the only broadcasting facility on board developed a fault which resulted in loss of modulation at times, until eventually broadcasting became impossible without a further rebuild. However 819kHz proved to be a far less than ideal choice of frequency. In Hereford in the West of England there is still a BBC local station on the channel, which seems to be operating on a rather higher power than the 37Watts officially published. This causes interference in much of the West Midlands, which some listeners report they cannot eliminate even with a frame aerial. Then in parts of the East Midlands and East Anglia, adjacent channel interference is reported from Chiltern Radio which broadcasts from Luton in Bedfordshire on 828kHz. on 819kHz even in inner London, only about seventy miles from the radioship, as darkness falls the more distant signals with higher powers come romping in and Caroline is swamped. Of course a new transmitter with a higher power capability is the only long-term answer, but meanwhile it would be wise to expect other frequencies to be tried out. But which frequencies? It has been suggested that 576kHz is the most likely candidate, being the lowest feasable frequency on the Medium Wave. But its by no means a clear frequency especially on the Continent. Listeners may recall that this spot has been used before, by Caroline and by Laser Hot Hits, both with higher power than Caroline can currently muster, and it was sometimes not possible to tell whether or not the station was on the air after dark! It would seem that 981kHz would be preferable for Caroline's many fans in Scandinavia. But further south it's no clearer than 819, and being an even higher frequency Caroline's signal would not penetrate inland quite so far. 801kHz has also been suggested. But although it is generally a slightly: clearer channel than 819 in Britain, it's not so good on the other side Qf the Channel, and still. 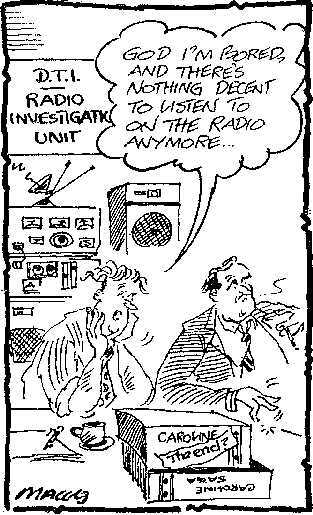 suffers from the problem of having a 2 kilowatt BBC local station on the frequency in Barnstable, Devon, plus of course Chiltern Radio is still adjacent on 792kHz from it's Bedford transmitter. Rumour has it that as Caroline has now vacated 558kHz it won't be long before Spectrum loses their 'extra' frequency of 990kHz. If this is the case, Caroline could do worse than be ready to leap into life on 990 as soon as the channel becomes free. Once again this couldn't cover the whole of Britain as there are no less than five low-powered local stations in odd corners of the nation sharing the slot, but it could put a reasonable signal into London, so it's certainly worth keeping an occasional ear on just in case! In general, the Medium wave is now so congested that there is no single fregency where one station could expect to cover the whole of the Britain Isles, Scandinavia and Western Europe satisfactorily, however high the power. In this respect Caroline has been a victim of her own success, for without her revolutionary influence twenty-six years ago we may never have had the variety of radio stations available to us that we can enjoy today! In the "Monitor Extra" which was published two months ago, Lord Jenkins was mentioned but was wrongly identified. Our reader Chris King points out our mistake: "The Liberal Democrat peer Lord Jenkins was formerly Roy Jenkins, not the Hugh Jenkins who was so much against commercial radio. Maybe, to make amends, you could mention that the Liberal Democrats are the party which is in favour of a written British constitution. Although this would not prevent bills like the Broadcasting Bill from being introduced, it would have prevented the notorious clause 159 from being sneaked into it." Consider it amended, Chris, and thanks for putting us right! This leaflet is being sent free to everyone who has paid for a copy of "Monitor" number 38. We know that many of our readers have subscribed to "Now Radio" and "Radio and Music" especially for. up-to-date news about what's happening on the North Sea, and now both of these magazines have ceased publication just at the time when there are important events occurring that you want to know about right away. "Monitor" is not a news magazine, and although we're not tied to any particular schedule it was not feasable to attempt to rush out an issue at this stage as the reorganisation we're currently in the middle of is causing chaos enough! Other free radio publications, however, do have publication schedules to stick to, and are not always in a position to drop everything to report a story immediately it hits the headlines. Hence we felt the need to resurrect "Newscaster", a publication which can be produced in a great hurry when the need arises to cast some news! Our thanks to the editor of the, original "Newscaster", Roy Brooker, for his permission to use the well-revered name, and his blessing. Our current technology doesn't facilitate us taking subscriptions this publication, so for the time being we're taking the easy way and sending it to everyone who's a fully paid up member of the "Monitor" mailing list. You don't need to acknowedge receipt of this leaflet - you will be sent a copy of "Monitor" number 39 as soon as it is published. "Newscaster" has been financed out of "Monitor" funds, but as each copy has cost less than 50p to produce and mail to you it's not worth the cost of the return postage for everyone to send a donation for it. The outlay will be covered if only those few of you in a position (in the current economic climate) to donate £2 or more actually do so (cheques made out to P. Gilbert, please, not to "Monitor" or "Newscaster"!). We suggest that anyone who would like to contribute but cannot send that much should instead send what they can afford to the Caroline Legal Fund - where literally every penny really counts towards the continuing fight for freedom! CM Subscriptions, 23 Grove Road, Grays, Essex RM17 6JY.